Yesterday I was lucky enough to get my suede soles in the mail. It was a very interesting process to make the suede soles fit. I was glad I made the BUMPEr that the pattern calls for as optional. Why? Because I felt comfortable cutting with my scissors around without fear, lol! 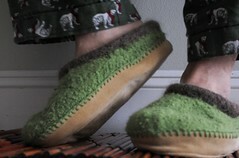 These babies are very comfortable and a great experience in felting by front loader. I will probably do a second pair and start the felting on the front loader washing machine, but move the rest to the bathtub. I follow the advice of people on the net to secur the soles. 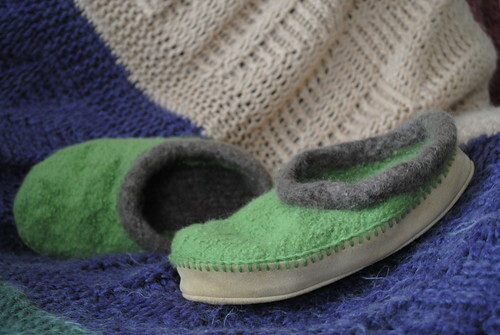 I actually used quilting pins to pin the sole to the slipper and then went around the slipper with the darning needle and thread. I think I did a pretty good job at this. 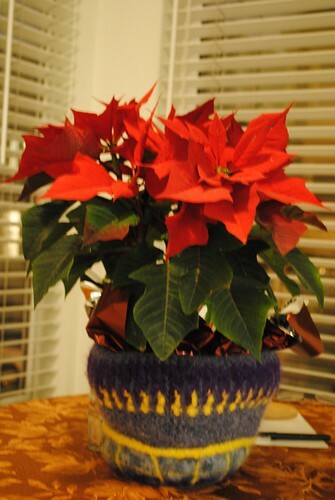 A flower pot came to be when a hat was too heavy to wear, lol! Actually I learned a lot about felting and crochet stiches. I also learned about embelishments and how they behave. The Vertical lines on the bottom was an experiment, they where not crochet, but actually threads that were over imposed. I was noticing after a bit of felting that the top, in this case of the picture t, the bottom was shrinking and pulling the hat or bowl in a strange way, so I got my scissors and cut them loose. This allowed the pattern to relax a bit and to continue the felting process. I now know how this will behave if I want to use it in the future. I want to thank you for your indulgence and for stopping by my blog today. I am hoping to go to Stitches West 2010 and will be manning the Warm Up America Booth, representing the Men Who Crochet Guild Chapter of the CGOA , doing some crochet and knitting for the Warm Up America Project . Come and say Hi!